Should resident physicians spend their training at the patient’s bedside, or at the fax machine? 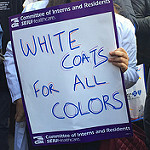 That’s the question that drove CIR members at Boston Medical Center to bargain for an ancillary services committee in their most recent union contract. “There were already some provisions in our CIR contract about house officers not performing certain tasks, like phlebotomy and patient transport,” said Dr. Hugo Carmona, a PGY 3 in internal medicine and co-chair of the newly formed committee. “During the contract negotiation, and even before this, there were residents starting to ask the question, do we need to do this work? Is this a resident-level job, or should it be done by someone else?” They began to identify some of the most frequent examples of non-educational work (often referred to as “scut work”) — tasks like obtaining outside medical records, sending discharge paperwork to other facilities, and retrieving patients’ medications from the pharmacy. Drs. Meiri and Carmona hope that by offloading some of these tasks, residents can return to feeling like doctors and spend their time making clinical decisions, instead of spending an hour getting records from another hospital, or getting consent forms signed for procedures they’re not performing. The discussion on how to delegate non-physician tasks is not isolated to BMC – it’s happening all over the country. Two things set BMC apart: first, the committee was established as part of a collective bargaining agreement, which makes it more enforceable. Second, the Chief Medical Officer (CMO) sits on the committee and brings key decision-makers to the table. Without collaboration from the administration, it would be much harder to implement solutions. Within the first few months, the committee reworked the way PICC (peripherally inserted central catheter) consents were obtained. Instead of residents (who may not have experience with the procedure) consenting patients, specially-trained nurses discuss the details and obtain the physical consent. They’ve also implemented two pilot projects. The first is to have unit coordinators obtain outside medical records instead of residents. “It didn’t make sense for residents to be pulled away from patient care to play phone tag and fax tag with another hospital. So we talked about it in the committee and we proposed that the unit coordinators take over this task,” said Dr. Carmona. The CMO tasked an Administrative Director with facilitating the unit coordinator’s’ role transition. The second pilot involves utilizing film librarians to upload imaging studies to the electronic medical record, instead of residents. Other tasks currently being considered by the committee include reviewing who else could be processing MRI forms for consentable patients and expanding a pharmacy technician program that streamlines the medication reconciliation process, a potential source for frequent medication errors. The Ancillary Services Committee will use survey results from each department to continue to identify non-educational tasks and develop proposals that allow physicians and other hospital staff to work at the top of their license. In the end, the residents argue that the burnout epidemic and low morale can’t be solved by duty hours limits alone, or just by salary increases.